A rising talent to watch out for, Nicole Raviv, cause in the voice of an angel we sometimes get closer to the truth. Performing live at NYC’s Iridium this summer past. Images supplied courtesy of the artist. A recent summer evening took this scoundrel along to rising soul singing star, Nicole Raviv’s superb ‘See me in September’ review at NYC’s Iridium. 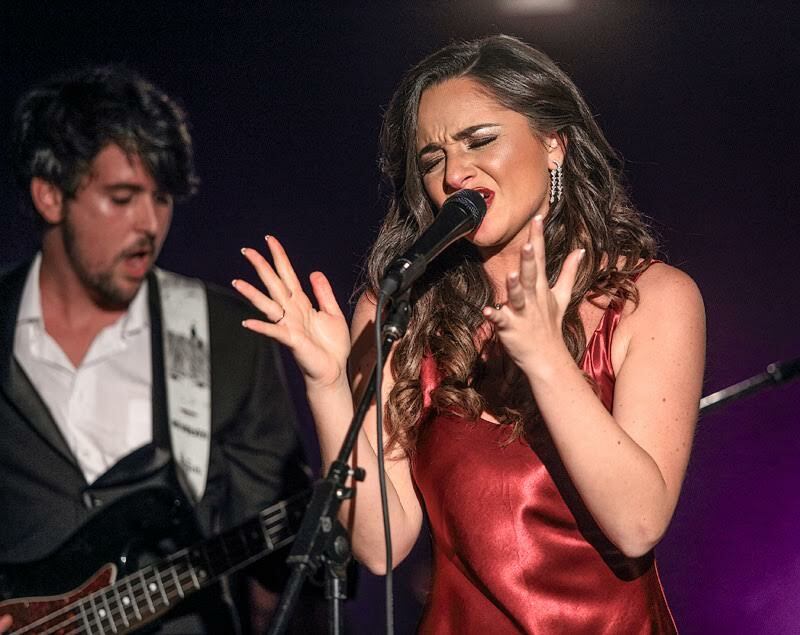 Along with a seven piece band, including Grammy award winning guitarist Carlos Alomar, of David Bowie/John Lennon ‘Fame’ acclaim, Raviv belted out a melange of classics along with her own rendition of originals, including her rising chart buster, ‘Soar’ where she questions identity, love and coming of age. Renditions that had audience members urging Raviv for encore after encore (literally). At the age of 22, Raviv is unlike many of NYC’s aspiring talents, she has the gusto, the chops and rare talent and a voice that reminds one of Amy Winehouse or Adele, rare feats in a sea of aspiring pop/soul stars. What she also has got going for is her tenacity and unrelenting desire to make it. Born in Montreal, Canada, Raviv received her training at the distinguished Conservatory of Music at McGill University. At the age of 10, she joined the touring cast of the Dora Wasserman Theatre where she found passion for acting. With a unique tone influenced by an older sound, Nicole’s success continued as she marked top 20 in Canada’s Got Talent’s first season, and started songwriting with producer Jordan Kaahn thereafter, releasing her songs to Virgin Radio, Montreal’s #1 Hit Music Station. Her love of music and live performance and the aspirational brought her to New York, where she received further voice and acting training, including her writing her play ‘Deadline Daters’ which was picked up by The Riant Theatre and received it’s first world premiere on a New York City Stage at The Strawberry One Act Festival in which she starred in. Currently on a back to back series of acting and singing tours, including a stint in the The Good Wife (CBS), and The Dr. Oz Show (ABC), Raviv has channelled her energies in new album “Equal Forces”, produced by Producer Chris Young, which includes her hit song, ‘Soar’, available on itunes and which is set to be released for the fall of 2015. Sitting down with the artist, I asked Raviv a series of questions, this is what she had to say. SCV: Listening to your first EP single, Soar, I sense the yearning of a young woman seeking to break free, both lyrically and metaphysically. What inspired the song? NR: I think I wanted to write and reflect about my journey, since coming to NYC, to ‘break free’, to find her voice, her identity and to reach for elevation of self. Ultimately it’s about freedom, giving oneself the permission to be who they really are and be who you are. SCV: Could one translate that to the type of material you sing, the challenges of an artist in today’s pop filled vacuum? NR: Every artist has to consider their brand, how they are going to identify with listeners, what message they have to say and how they are going to say it. Sometime’s I’m torn, do I steer towards more soul infused music or do I make things more pop orientated? SCV: Having said, what can we expect from your upcoming EP, Equal Forces? NR: I’m still working on it. I am writing new songs where I want to continue exploring identity, the voice of a young woman coming into her own being. SCV: Who are some of your influences and why? NR: I have to say Amy Winehouse, Alicia Keys, and Adele. It’s about being daring to be brave as a woman and to express oneself from heart ache, desire and a sense of what it actually means to be a woman. SCV: How are you finding yourself being received? NR: Actually I was surprised to find out that a lot of my fans are younger than what I had envisaged. But I want to continue pushing the envelope and see where that takes me. SCV: You mentioned that you weren’t happy just singing other’s songs but wanted to create your own music. Why? NR: I think that’s how a real artist comes to being, has something of themselves to offer and hopefully for audiences to relate to. But yes I want to concentrate on the defining the journey of what it means to be a young woman. I am not content just to audition for Broadway roles or sing covers, I want to strike my own voice. SCV: Have you ever had your heart broken? NR: (pause) Yes. (laughs resigned). I guess that’s part of love too, giving and receiving and loss. NR: To get Equal Forces charting when it finally comes out, on billboards with the hopes of securing a major record deal. I wouldn’t say no. SCV: You think you might end up becoming a major pop star? NR: I think as long as I become and elevate myself to who I need to be I will find happiness and success. I will let you define for you what my music does for you. SCV: And heart ache? Which of course you will sit down and write about and sing in striking aplomb. SCV: Yes I should think so ….